Activity at Yellowstone’s supervolcano is ramping-up, causing some in-the-know to prepare for what could soon make two-thirds of the United States uninhabitable. 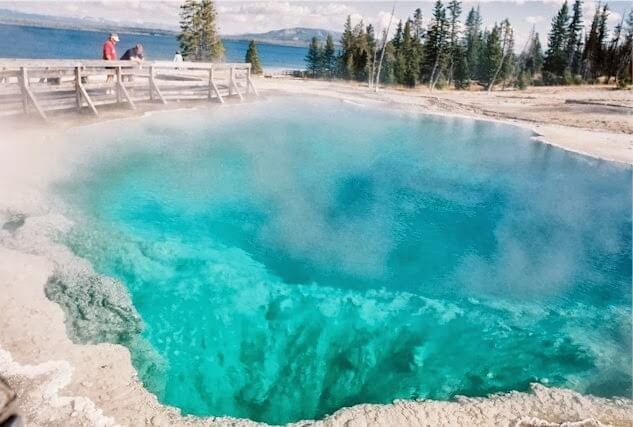 YELLOWSTONE, WYOMING — Recently the massive 300 mile wide underground supervolcano and pool of liquid hot magma at Yellowstone National Park has become alarmingly active. So far, mainline scientists and press have kept the cause of the activity tight-lipped, but one thing is for sure, something is definitely going on underground in the region. In fact it has been documented that the ground in and around Yellowstone has risen over 3 inches per year lately, which is scary data to receive for modern researchers. According to scientists, if the massive Yellowstone supervolcano erupted, it would likely dump up to 10 feet of ash over two-thirds of the U.S., causing such devastation that almost nothing would survive. The entire Continental United States (CONUS) would be engulfed in darkness from the volcanic dust, possibly for days if not weeks and no food would grow or reach the grocery store shelves for that matter. We as Americans would be in the midst of chaos, like never seen before. All of the power and technology would likely be rendered useless and unworkable to any survivors. And this ladies and gentlemen is also why we have to consider the fact that FEMA camps are real and will likely be activated in the event such a disaster were to arise. Provisions for this type scenario were previously laid out by President Ronald Reagan and Col. Oliver North with the controversial and secretive Readiness Exercise 1984 (REX84) program. Interestingly enough this program was initiated shortly after the U.S. Government and NASA spotted an incoming solar body (i.e. Planet X, Nibiru) with the IRAS satellite in the early 1980′s. This report was later covered-up and the topic was silenced from the mainline press ever since. However, most recently with the ramp-up in seismic activity in and around the Yellowstone region, one must question what is truly going on. Recent “quake swarms” are to blame, but the source of the earthquakes is baffling to researchers and could be possibly be influenced by a planetary alignment according to some experts and peer-reviewed studies. In mid-September KOMONews.com reported, “Yellowstone’s recent earthquake swarms started on Sept. 10 and were shaking until about 11:30 a.m. Sept. 16. Including smaller events that have not been verified, there were many more quakes, Smith said. The recent swarms produced roughly four quakes that were large enough to feel. The first, a magnitude 3.5, struck Sept. 13 about 17 miles northeast of West Yellowstone, Mont. Then, in the early hours Sept. 15, two quakes, a magnitude 3.2 and magnitude 3.4, were detected in quick succession at 5:10 and 5:11 a.m., about 15 miles southeast of West Yellowstone. The magnitude 3.6 that marked the peak of the swarm struck nearby about 4 1/2 hours later. About half a dozen earthquakes are felt in Yellowstone in an average year, he said.